TUCSON, Arizona, November 22, 2011 (ENS) – For the first time since 2009, a jaguar has been found roaming the wilds of southern Arizona. The jaguar was photographed by a hunter on Saturday and confirmed by the Arizona Game and Fish Department to be a roughly 200-pound male in good condition. Arizona Game and Fish received the report on Saturday morning from an experienced hunter using dogs to hunt mountain lions. 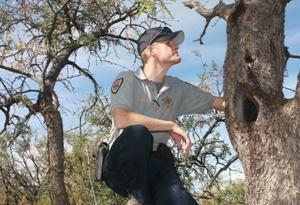 The dogs pursued the animal and treed it 15 feet up in a mesquite tree, and the hunter was able to obtain photographs and video. After photographing the jaguar, the hunter quickly left the area with his dogs and observed from a distant point. The jaguar remained in the tree for about 15 minutes and then headed south. Game and Fish categorizes the report as a Class I-10, meaning the report is considered verifiable or highly probable, and visual or physical evidence is provided and confirmed. Officers from the state agency collected hair samples from the area where the jaguar was found for possible DNA testing. Based on the images provided by the hunter, biologists believe the jaguar is an adult male that appeared in good, healthy condition and weighed approximately 200 pounds. Biologists will compare the photos and video to images of other jaguars photographed in Arizona in the past. They will try to use comparisons between a jaguar’s unique rosettes to determine if the animal has been identified previously. The agency says that four of the last five confirmed jaguar sightings in Arizona have been reported by hunters, who all took responsible action to document the animal, report it to Game and Fish, and remove their dogs from the area once the animal was identified as a jaguar. These hunters have provided biologists with critical information that may not otherwise be known, information that will help increase the understanding of the species’ existence in the borderland area. The species has been protected outside of the United States under the Endangered Species Act since 1973. That protection was extended to jaguars within the United States in 1997, the year after their presence in the Arizona and New Mexico borderlands was confirmed. The last known jaguar in Arizona, named “Macho B,” died after being illegally trapped by a contractor for the Arizona Game and Fish. Macho B roamed Arizona from 1996 to 2009, but was never known to have mated. “It’s heartening to see that at least one jaguar is back in southern Arizona,” said Michael Robinson of the nonprofit Center for Biological Diversity. Jaguars were placed on the federal Endangered Species List in 1997, following advocacy of jaguar conservation by the Center for Biological Diversity. The Center also won a court order requiring the U.S. Fish and Wildlife Service to develop a jaguar recovery plan and designate critical habitat where the jaguar’s recovery will be prioritized. A draft recovery plan and draft critical habitat rule are both expected next year. 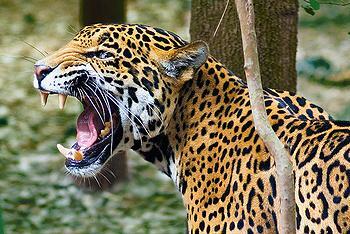 Jaguars are the only cat species in North America that roars. They prey on small mammals, fish, birds and reptiles. Females breed year-round and have litters of one to four cubs that stay with their mother for nearly two years. As noted by the U.S. Fish and Wildlife Service in a 2006 report, there appears to be “regular intermittent use of the borderlands area by wide-ranging males. The report notes that because there has been “no indication of the presence of females or cubs,” the physical and biological features in the United States may allow individual transient jaguars to survive, at least temporarily, but do not support a breeding population. The last female jaguar in the United States was killed in 1963 in east-central Arizona, and no jaguar reproduction has been documented in the country since then.